The best cork rings available for handcrafting your own grips. Bore Choose an optionNo Bore.25"
The best cork rings available for handcrafting your own grips. The main photo shows rings from an earlier batch of A+ cork; we still have some of these no-bore rings available. The other grades in the photo group were photographed the same year – left to right in the three lower images you’re looking at B, A, & A-. Yes, we photographed the best side of the rings. Who wouldn’t want to show off their good side? Realistically, this emphasizes an important point when it comes to making grips…you need to show off the better aspects of the cork you buy, from any supplier, by intentionally orienting each ring in the grip so that the final contours of the grip will mask any larger flaws in the individual cork rings. The more effort you put into organizing the rings as you lay them out over the length of the grip prior to glue-up, the better your grip will appear once complete. As the best people are wrought by both nature and nurture, so the best grips are crafted through a combination of product quality and quality of craft execution. When you see a fabulous grip, one that is clean, smooth, and with no tear-out from coarse files or sand paper, you’re not looking at a grip that was formed by happenstance, or merely from a better grade of cork rings; you’re looking a grip that was intentionally stacked, with a pre-determined contour already mapped out, then it was rough sanded to about 1/8″ larger than final spec, and the last 1/8″ was removed with increasingly fine-grit papers, typically working from 80 grit, through 120, 220, 320, 400, 600, and, possibly, 1200 grit. In its final form, the contours should match the pre-established plan for the grip, thus minimizing surface lacunae, the grip should have absolutely no micro-tear-out caused by moving too rapidly from coarse paper to fine paper without the benefit of intermediate grits, and it should feel like silk in the hand. Over time, after years of angling, the grip will naturally develop the patina that speaks to its history in use. Until then, let it be a perfect, natural, grip. Because I’m asked often, here are two more thoughts: glue & pressure. I use garden variety water-resistant yellow woodworkers glue (e.g., Titebond-II) between the rings….get complete coverage using a Popsicle stick (or a messy finger), but let it be a thin layer. Compress the grip tightly in a clamp overnight. I use the Abbott Cork Clamp that we offer. How tightly? I try to crush a 6″ grip by up to 1/8″ while it’s in the clamp, then I unclamp it and let it rest for at least a day prior to turning the grip; be aware, the grip may not return exactly to the 6″ mark and it certainly won’t if you over-crush the rings. If you’re scant, but sufficient, with the glue, and you clamp tightly (for good measure, remove squeeze-out with a cloth dampened in warm water immediately after you clamp), then when you sand the grip down you’ll have essentially invisible – and palpably indiscernable, i.e., un-felt – glue lines. 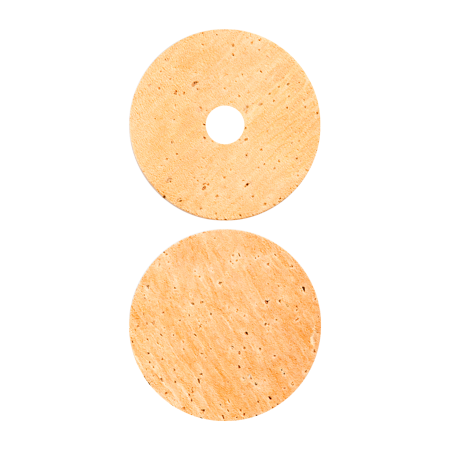 Cork quality varies from year to year, so please expect this; it may be worth buying a viable sample of two grades for comparison, say 12 rings in each grade, so you can determine which grade or which price point best serves your needs. Please be sure to select 1/4″ bore or No bore. All rings are 1-1/4″ O.D. x 1/2″ thick. Hey, thanks very much for your enthusiastic email. I appreciate hearing that other rodmakers put you onto us for good A+ cork. Sounds like you’ve got a great project you’re working on! First, please do understand this is ‘realistic’ A+ cork. It is nice, but it’s merely the best of what we can source in Portugal each year. Cork, generally speaking, has declined in quality over the years, so don’t expect truly flawless rings. It is imperative that you place each ring intelligently within your grip so that you either sand off, or bury, any unfortunate lacunae that may be present. If you really think about ring placement relative to the final shape of your grip, the result can be impeccable compared to what you’ll see on most rods, but odds are it will not be truly flawless. Second, we have two batches of A+ in the shop right now. The older batch is our ‘no-bore’ cork and these rings are cleaner, on average, than the most recent batch of 1/4″ bore rings. If you don’t mind the extra work of boring out the rings on your own, it’s worth buying the no-bore rings. Some fellows buy bored rings for most of the grip, and add two no-bore rings for the end rings on the grip, which is a good compromise. Third, there are two ways to buy the rings….if you buy a bag of 250 rings, you receive them as we receive them from Portugal and within each bag there are a few gems to harvest for that one-of-a-kind show rod, and a few pieces that are garbage (splits or other flaws that should have been caught by the graders but weren’t)….and most of the rings fall in the middle of each nominal grade (A+, A, A-, B). When you buy cork by the ring, my staff (that’s Nikki, Drake, or myself) pulls the number of rings you ordered, plus 10%, from our bin, and we sort out the worst 10% and toss them into the bin of the next lowest grade and ship you the balance….generally speaking, this ensures that you won’t get any flawed rings (splits, or partials, or something that looks nice on one side but is stained on the other). If, say, you order 24 rings of A+, then we’d pull 30 rings “blindly” from the A+ bin; six of these 30 would be downgraded to the A grade bin, and you’d receive the best twenty-four out of thirty. Beyond that we can’t do more, i.e., hunt an entire bin for better rings, or we’d be hurting the average quality of the rings for the next fellow who orders. We do our very best to be fair to every client. One common question we get is, “Well, what do you do with the rings rejected from the B grade bags?” Great question! We donate them to various rodmaking groups, along with a hank of rattan and a spool of silk as a “Rattan Grip Kit” because the extra-porous cork still makes a fine substrate for rattan-wrapped grips. More than anything, it’s important to understand that these rings, even the very best of them, are a natural product and they do show the ‘flaws’ of being a natural product insofar as they have slight color variations from ring to ring, and even within a single ring, and they all have lacunae – but far fewer in the A+ grade than in the A grade. The best thing to do, to satisfy yourself that we’re selling good cork, is to buy two or three dozen rings from us and an equal amount from some of our competitors. While the quality shifts every year with each new harvest, I’m confident our team in Portugal is shipping cork that will stand up well in any comparison of nominally A+ or Flor cork from any other supplier. This is the reason that many professional rodmakers, as well as some rodmaking instructors, buy bulk rings through our shop…..the material is pretty darn consistent from year to year, and it beats the quality of what they’ve been able to source elsewhere. It’s not the cheapest cork, but you wouldn’t expect it to be both cheap and of good quality relative to each grade.